I didn't notice how fairly quiet a year it's been for zombies until doing this round-up of all the flesh-eaters this year's media has to offer, but there were definitely some highlights that more than fill those gaps. Some duds, too, but you can't expect such a watered down narrative to always go over so creatively. So let's take a look back at 2012 and all the zombie media that it had to offer. From games to comics to TV shows to film, here are a few highlights. If we missed any you're keen on, share your noteworthy selections in Kinja below. This is the star of the list. Telltale's wonderfully harrowing episodic series was a somber exploration through your personal judgments as the game threw increasingly difficult decisions your way. The point-and-click adventure game also featured some refreshingly interesting characters, including a remarkably enjoyable young Clementine and a steadfast Lee. Though definitely the mediocre platform of the bunch, the iOS version available was an alternative to non-console gaming users. Which is great, because the more people that play this touching eye-opener the better. There were hits and misses embedded in this franchise's 2012 existence. Resident Evil 6, for instance, was incredibly underwhelming. As much as the game tried to make interesting changes to the series, it felt too outdone by other games. Resident Evil: Revelations was a surprise hit on the 3DS, combining a quality Resident Evil vibe with an episodic structure that suited the mobile game well. And then Resident Evil: Operation Raccoon City ran somewhere in the middle at mediocre. The mod so good it's getting its own standalone game, DayZ has had an incredibly good year. It's marked by hundreds of compelling player tales on survival and trust, and a bunch of funny videos, too. Truly an experience unlike any other MMO or zombie game. Not only is ZombiU arguably the game that makes best use of the Wii U's GamePad capabilities so far in the early launch days of Nintendo's new console, but it's also a fascinating game. The shooter experiments with new concepts—like having to kill zombified versions of your previous lives—and includes an incredibly fun multiplayer mode, too. I would like to tell you that the butler did it, but he did not. But, wait! This is a first-person, war shooter! Well it also has a multiplayer option completely dedicated to zombies. And it's quite good, if not a little tough. Zombro is a clever, bright puzzle game where you can dismember your zombie body to roll, bounce, and crawl your way around each level. It's a lot of fun. Deploy survivors, give them tasks, and survive. Here's an interesting take on the world of zombie games. Zombies, Run! is an exercise game. As you go for a run around your neighborhood, you'll be listening to the story and taking instructions from the game, picking up supplies while being chased by zombies. I imagine viewers are split on this one, as video games adapted into movies are never great. But our movie reviewer, Matt Hawkins, thinks that there are enjoyable elements to the latest film. Like great action sequences and some actual nods to the game, albeit not always too accurately. This stop-motion animated zombie flick is different than what you're used to. It leans to the comedy variety rather than a horror film. 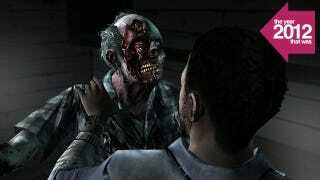 Protagonist Norman has to use his ability to speak with the dead to fend off against the living dead. It's an adorable entry in what is normally a gross and scary one. Perhaps not the most unique of zombie movies, REC 3: Genesis is at the least packed with gore and ludicrous action. What else can you expect of a wedding gone awry at the hands of a disgusting and infectious illness? AMC's The Walking Dead, based on the comic book series, started off strong. Though losing some of its viewer loyalty somewhere near the end of season one and a whole lot of boring farm episodes in season two, the show has since picked up the pace in recent months with season three where the group of survivors finally starts to make more moves. The highlight of which has to be Daryl, who is certainly my favorite character, and unique to the show. Robert Kirkman's The Walking Dead series is absolutely fantastic. Artist Charlie Adlard's powerful black-and-white imagery adds to the many, many tense moments in the series that has been ongoing since 2003. It follows a group of survivors as they meet their biggest threats head-on: other survivors. Think of the series as less about zombies and more about the world zombies have left in their wake. From Evan: If you only know Robert Kirkman from The Walking Dead or his other creator-owned hits like Invincible, you may not know that he delivered a gleefully gross mash-up of superheroes and shambling undead a few years back. Marvel Zombies gave us versions of Captain America, Hulk, Spider-Man and others who devoured every human being on their home planet and went battling across the multiverse to hunt for more fresh meat. This year, a massive anthology collected all the MZ mini-series between two covers. It's good gory fun that makes the good guys very bad. Get it for the zombie lover in your life.